The Bharatiya Janata Party (BJP) today raked up the Ram Temple issue ahead of the Uttar Pradesh Assembly election scheduled next year and urged all to wait for the Supreme Court's final verdict or achieve mutual consensus on the same. BJP president Amit Shah said the Ram Janmabhoomi is a part of his party's election manifesto. "We have specified that the Ram temple should be made on the site either after a consensus or by the directions of court. This is our firm stand," he told the media here. 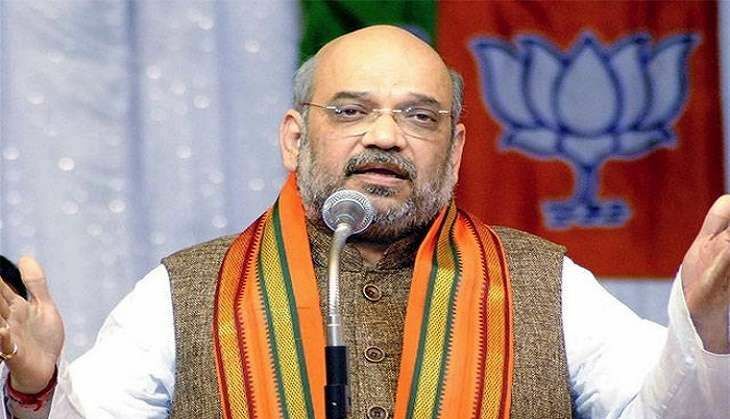 Shah further said the BJP will contest the polls in Uttar Pradesh on the issue of development. "The BJP has never agreed with whatever Sadhvi Prachi has said. We do not endorse Sanjeev Balyan's remarks on Dadri controversy. Our agenda is only development," he added. The BJP president also used the occasion to take potshots at the ruling Samajwadi Party (SP) and alleged that Chief Minister Akhilesh Yadav-led government has failed to curb corruption. The comment from the BJP chief comes after Minister of State for Ministry of Micro Small and Medium Enterprises, Kalraj Mishra said that his party would not make the Ram temple an election issue in Uttar Pradesh. Mishra had said the construction of Ram temple in Ayodhya is a national issue but the BJP will not make it an issue in the Uttar Pradesh elections. Union Home Minister Rajnath Singh had recently in an interview said that his party would fight next year's Assembly polls in Uttar Pradesh on the issue of development. Singh said the issue of construction of Ram temple in Ayodhya is an important "cultural issue" and not political. "The Ram Mandir issue is not political, but a cultural issue. The matter is also sub-judice. The matter is in the Supreme Court and we are only waiting for the judgment," he said. The Home Minister also said that his party has never indulged in the politics of communal polarisation for votes.